What’s is Chiropractic all about ? Most of us have heard that the body has a vast system of nerves! few people truly understand the importance of the nervous system. The nervous system is comprised of your brain (the master-computer), your spinal cord, 31 pairs of spinal nerves that exit from your spinal cord starting at the base of your skull and continuing down to your tailbone, and then thousands of other nerves that go to all parts of your body. Recognizing the supreme importance of the nervous system, nature in her infinite wisdom has protected the brain within a solid skull, and the spinal cord within the bony masses of the spinal column. The spinal column is comprised of 24 vertebrae: seven vertebrae in the neck, 12 vertebrae in the thoracic or mid back region, and five vertebrae in the lumbar or lower back region. These vertebrae allow for movement of your body as well as serving somewhat like a conduit for the spinal cord, allowing a pathway for communication between the brain and all parts of you body. So, we have the brain, the spinal cord, a series of spinal nerves, and a complex highway of nerves that run to every cell, tissue and organ within your body. 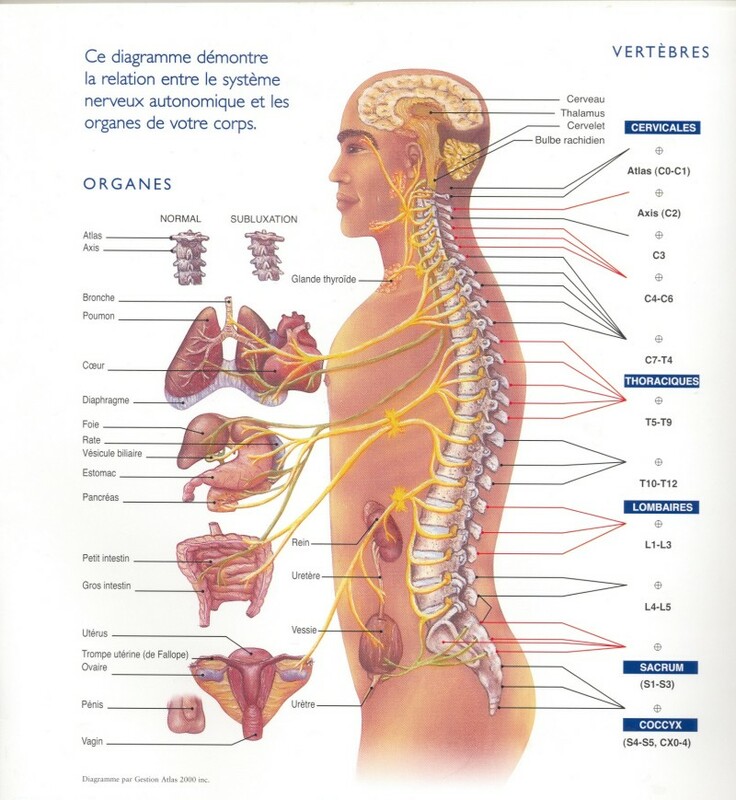 The primary anatomy text used in most health science courses, Gray’s Anatomy, states:“ The nervous system controls every cell, tissue, organ and function in the human body“. If the nervous system is working at 100%, then all messages can go from the brain to the various parts of the body, and from the parts of the body back to the brain. It is truly a two-way communication system that allows instant control of all activities within the body, as well as a constant feedback loop to the brain, so that the brain knows instantly the status of everything within your body. In other words, the nervous system controls and regulates all activities within the body-every breath you take, every beat of your heart, every blink of your eye, as well as thousands of other functions. A decrease of nerve impulses, or messages anywhere along the nervous system can lead to a decrease of function within you body. Likewise interference along this pathway can deprive the brain of valuable information from the cells and tissues of the body. Either of these conditions can lead to serious health concerns. In order for one to experience optimum health, it is vital that the brain sends all messages to the cells and in return the cells must be able to inform the brain of their status and needs. Most of us would agree that oxygen, water and food required elements to maintain life. Unfortunately, few recognize the importance of nerve function with regards to health and vitality. Nerve impulse or nerve flow appears to be the most commonly overlooked essential requirement for life, health and well-being. Nerve impulse is the transmission of life energy or life force, that keeps every human and animal alive. Not some, but all bodily functions are dependent on receiving these impulses from the brain to maintain an optimal level of function. Even slight variations in these impulses can have a detrimental effect resulting in a lack of function, disease and death. One of the most common and major causes of nerve interference is referred to as subluxations. When segments of the spine become subluxated interference within the nervous system occurs, much like static on a telephone line. This interference makes it impossible for the nerve impulses to go to and from your brain in a normal manner, thus making it impossible to maintain or achieve optimum health and function, regardless of your food, water and oxygen. The primary role of your family chiropractor is to detect and correct subluxations, thus improving nerve impulses and allowing normal function to return to all systems. Without subluxations, normal nerve impulses flow from your brain to every cell of your body, allowing your body to function in the manner it was intended. Those who choose chiropractic for a lifetime, with visits beginning at birth and continuing throughout life, truly tap into the power of having a nervous system that functions at an optimum level!